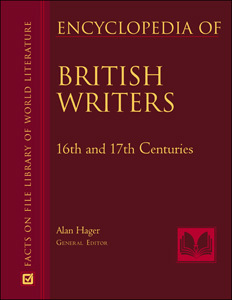 The two-volume Encyclopedia of British Writers: 16th, 17th, and 18th Centuries provides essential, curriculm-based information on approximately 750 major British writersfrom William Shakespeare and John Milton to Jonathan Swift and Alexander Popewho flourished in Britain between the 17th and the 18th centuries. All accessible entries include imporatant details about the author's life, a synopsis of the writers's major works, and suggestions for further reading. Volume 1 covers the English Renaissance, including Shakespeare and other major Elizabethan writers Christopher Marlowe, Andrew Marvell, Sir Philip Sidney, and moreand the writers of the 17th century, including John Milton and the metaphysical poetsJohn Donne, Andrew Marvell, George Herbert, and others. Volume 2 covers the Restoration period and the Age of Reason, with entries on such writers as Alexander Pope, John Dryden, Jonathan Swift, Samuel Johnson, James Boswell, Samuel Pepys, and many more. This volume covers Aphra Behn, John Bunyan, Robert Burton, Thomas Campion, Margaret Cavendish, Richard Crashaw, Samuel Daniel, John Dryden, George Herbert, Robert Herrick, Ben Jonson, Christopher Marlowe, Andrew Marvell, John Milton, Walter Raleigh, William Shakespeare, Edmund Spenser, John Suckling, Henry Vaughan, Izaak Walton, Mary Wroth, Thomas Wyatt, and many more. This volume covers George Berkeley, James Boswell, Edmund Burke, Robert Burns, Daniel Defoe, Henry Fielding, John Gay, Oliver Goldsmith, Thomas Gray, David Hume, Samuel Johnson, Mary Wortley Montagu, Alexander Pope, Matthew Prior, Ann Radcliffe, Christopher Smart, Laurence Sterne, Jonathan Swift, Horace Walpole, Mary Wollstonecraft, and many more. "A good choice for libraries catering to high school and undergraduate students." "...a good resource for young students to use for a background in the literature of the time period...recommended for public or high school libraries."